Download "CHLORPHENAMINE. The medicine you have purchased contains chlorphenamine." 1 What is in this leaflet CHLORPHENAMINE New Zealand Consumer Medicine Information The medicine you have purchased contains chlorphenamine. This leaflet is intended to provide information on the active ingredient chlorphenamine, which is contained in many different medicines. The packaging of the medicine you have bought should be read carefully. 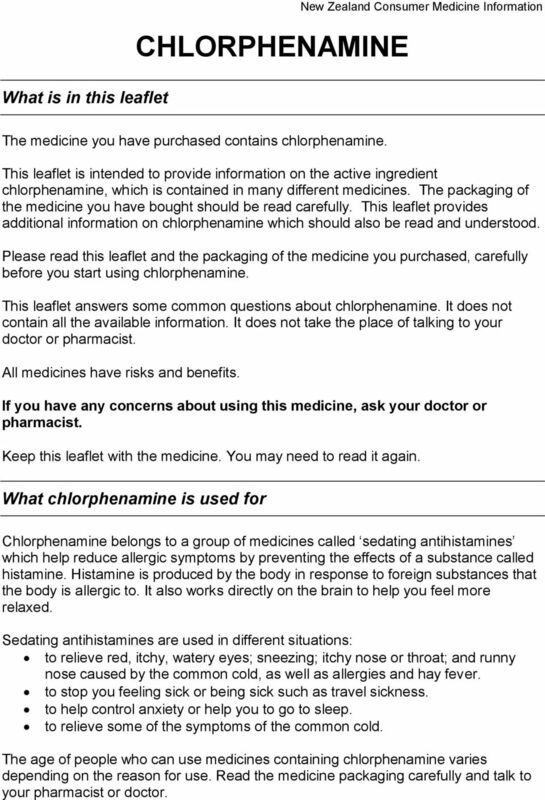 This leaflet provides additional information on chlorphenamine which should also be read and understood. 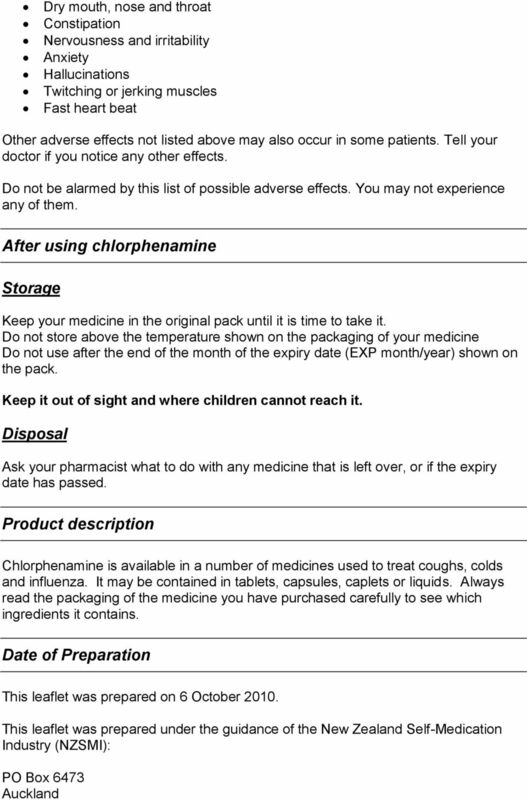 Please read this leaflet and the packaging of the medicine you purchased, carefully before you start using chlorphenamine. 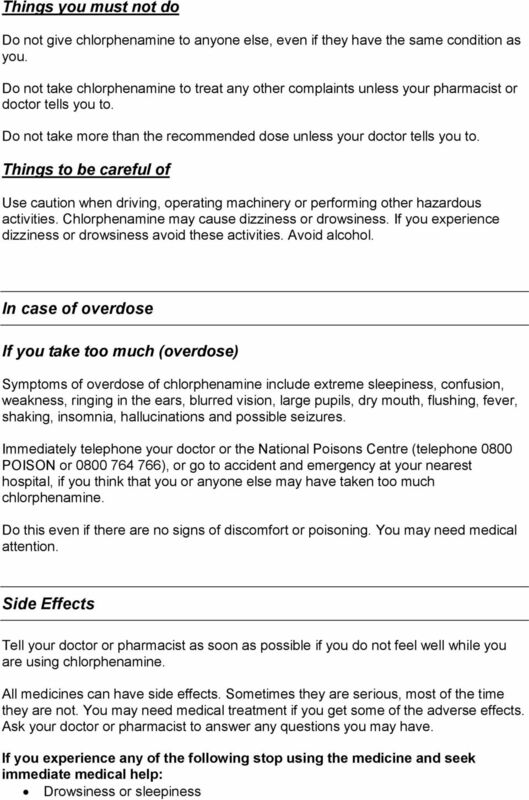 This leaflet answers some common questions about chlorphenamine. It does not contain all the available information. It does not take the place of talking to your doctor or pharmacist. All medicines have risks and benefits. If you have any concerns about using this medicine, ask your doctor or pharmacist. Keep this leaflet with the medicine. You may need to read it again. What chlorphenamine is used for Chlorphenamine belongs to a group of medicines called sedating antihistamines which help reduce allergic symptoms by preventing the effects of a substance called histamine. Histamine is produced by the body in response to foreign substances that the body is allergic to. It also works directly on the brain to help you feel more relaxed. Sedating antihistamines are used in different situations: to relieve red, itchy, watery eyes; sneezing; itchy nose or throat; and runny nose caused by the common cold, as well as allergies and hay fever. to stop you feeling sick or being sick such as travel sickness. to help control anxiety or help you to go to sleep. to relieve some of the symptoms of the common cold. The age of people who can use medicines containing chlorphenamine varies depending on the reason for use. Read the medicine packaging carefully and talk to your pharmacist or doctor. 2 There may be more than one active ingredient in your medicine, such as paracetamol, ibuprofen, a cough suppressant or a nasal decongestant. If you are taking more than one cough and cold medicine, please read the packaging of each medicine carefully to ensure you are not taking the same active ingredient from 2 or more medicines. Taking the same active ingredient from more than one medicine could mean you are taking too much of that active ingredient. Ask your doctor or pharmacist if you have any questions about chlorphenamine. 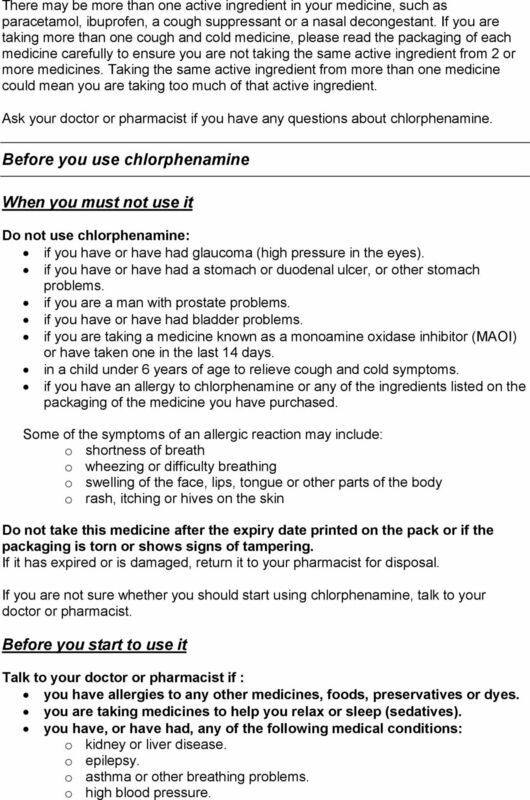 Before you use chlorphenamine When you must not use it Do not use chlorphenamine: if you have or have had glaucoma (high pressure in the eyes). if you have or have had a stomach or duodenal ulcer, or other stomach problems. if you are a man with prostate problems. if you have or have had bladder problems. if you are taking a medicine known as a monoamine oxidase inhibitor (MAOI) or have taken one in the last 14 days. in a child under 6 years of age to relieve cough and cold symptoms. if you have an allergy to chlorphenamine or any of the ingredients listed on the packaging of the medicine you have purchased. Some of the symptoms of an allergic reaction may include: o shortness of breath o wheezing or difficulty breathing o swelling of the face, lips, tongue or other parts of the body o rash, itching or hives on the skin Do not take this medicine after the expiry date printed on the pack or if the packaging is torn or shows signs of tampering. If it has expired or is damaged, return it to your pharmacist for disposal. 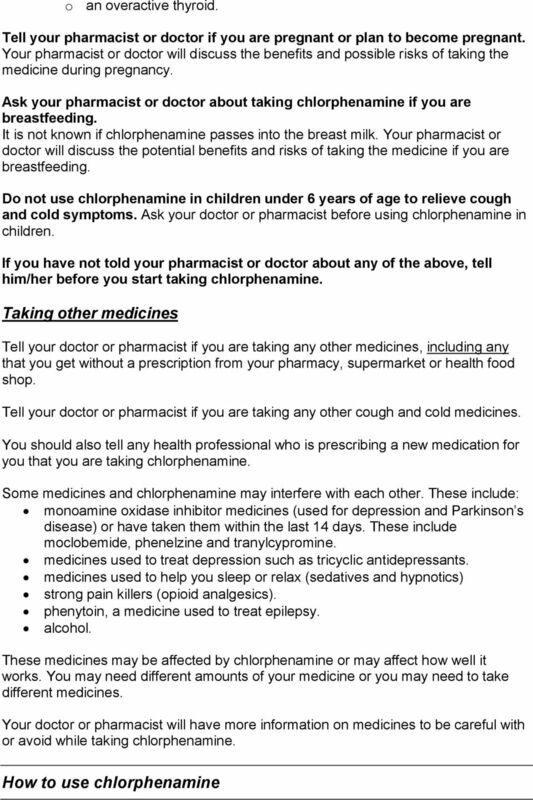 If you are not sure whether you should start using chlorphenamine, talk to your doctor or pharmacist. Before you start to use it Talk to your doctor or pharmacist if : you have allergies to any other medicines, foods, preservatives or dyes. you are taking medicines to help you relax or sleep (sedatives). you have, or have had, any of the following medical conditions: o kidney or liver disease. o epilepsy. o asthma or other breathing problems. o high blood pressure. 4 Follow any directions given to you by your pharmacist or doctor carefully. They may differ from the information contained in this leaflet. 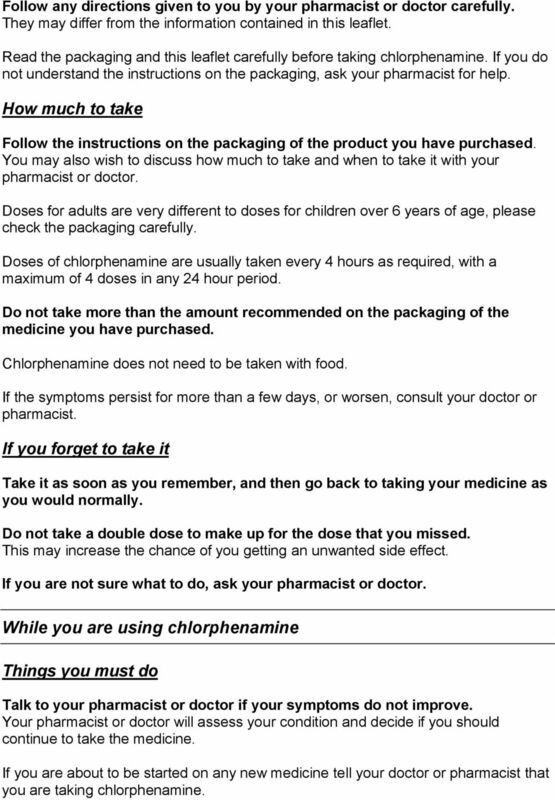 Read the packaging and this leaflet carefully before taking chlorphenamine. If you do not understand the instructions on the packaging, ask your pharmacist for help. How much to take Follow the instructions on the packaging of the product you have purchased. You may also wish to discuss how much to take and when to take it with your pharmacist or doctor. Doses for adults are very different to doses for children over 6 years of age, please check the packaging carefully. Doses of chlorphenamine are usually taken every 4 hours as required, with a maximum of 4 doses in any 24 hour period. Do not take more than the amount recommended on the packaging of the medicine you have purchased. Chlorphenamine does not need to be taken with food. If the symptoms persist for more than a few days, or worsen, consult your doctor or pharmacist. If you forget to take it Take it as soon as you remember, and then go back to taking your medicine as you would normally. Do not take a double dose to make up for the dose that you missed. This may increase the chance of you getting an unwanted side effect. If you are not sure what to do, ask your pharmacist or doctor. While you are using chlorphenamine Things you must do Talk to your pharmacist or doctor if your symptoms do not improve. Your pharmacist or doctor will assess your condition and decide if you should continue to take the medicine. If you are about to be started on any new medicine tell your doctor or pharmacist that you are taking chlorphenamine. 7 New Zealand Ph: Should you have any questions regarding the product you have purchased, please contact your doctor, pharmacist or the manufacturer (contact details should be provided on the packaging of the medicine you have purchased). Consumer Medicine Information. The medicine you have purchased contains Oxymetazoline Hydrochloride. SOTALOL is used to prevent and treat an irregular heart rhythm or beat, also called arrhythmia. SOTALOL Sotalol hydrochloride 80mg and 160mg Tablets What is in this leaflet This leaflet answers some common questions about SOTALOL. It does not contain all the information available on this medicine. New Zealand Consumer Medicine Information. It does not take the place of talking to your doctor or pharmacist. MS Contin suspension Morphine sulfate (mor-fean sul-fate) Consumer Medicine Information What is in this leaflet This leaflet answers some common questions about MS Contin controlled release granules ("suspension"). NEW ZEALAND CONSUMER MEDICINE INFORMATION Paroxetine Tablets 20mg What is in this leaflet This leaflet answers some common questions about. It does not contain all the information available on this medicine. 1 PV 5859 AMP MEDICATION GUIDE STRATTERA (Stra-TAIR-a) (atomoxetine) Capsules Read the Medication Guide that comes with STRATTERA before you or your child starts taking it and each time you get a refill. MEDICATION GUIDE WELLBUTRIN (WELL byu-trin) (bupropion hydrochloride) Tablets Read this Medication Guide carefully before you start using WELLBUTRIN and each time you get a refill. There may be new information. DP-ANASTROZOLE. ANASTROZOLE, 1 mg Film coated tablets. This leaflet answers some of the common questions about DP-ANASTROZOLE. MEDICATION GUIDE WELLBUTRIN XL * (WELL byu-trin) (bupropion hydrochloride extended-release tablets) Read this Medication Guide carefully before you start using WELLBUTRIN XL and each time you get a refill. used to treat inflammation, corneal injury and bacterial infections in the external part of the eye. Intestinal Permeability Leaky Gut Syndrome Protocol Dr. Kurt Woeller, D.O. MS Mono capsules Morphine sulfate (mor-fean sul-fate) Consumer Medicine Information What is in this leaflet This leaflet answers some common questions about MS Mono controlled release capsules ("capsules"). MEDICATION GUIDE ARMODAFINIL (ar moe daf i nil) TABLETS C-IV Read the Medication Guide that comes with armodafinil tablets before you start taking it and each time you get a refill. There may be new information. This leaflet answers some common questions about ARROW - MELOXICAM. MEDICATION GUIDE. What is Morphine Sulfate Oral Solution? A ragweed pollen as a treatment for a ragweed allergy? It s called immunotherapy. Infliximab is used to treat psoriasis, psoriatic arthritis, and several other inflammatory conditions, including other inflammatory skin diseases. Galvumet Vildagliptin/Metformin hydrochloride Consumer Medicine Information What is in this leaflet This leaflet answers some common questions about Galvumet. It does not contain all the available information. There is no information on the use of this medicine in those below 12 years of age.